It is a pleasure for me to write a letter of reference for Mr. Bart Christner, who has applied for the Assistant Director of Publications and Visual Production position with Longwood College. 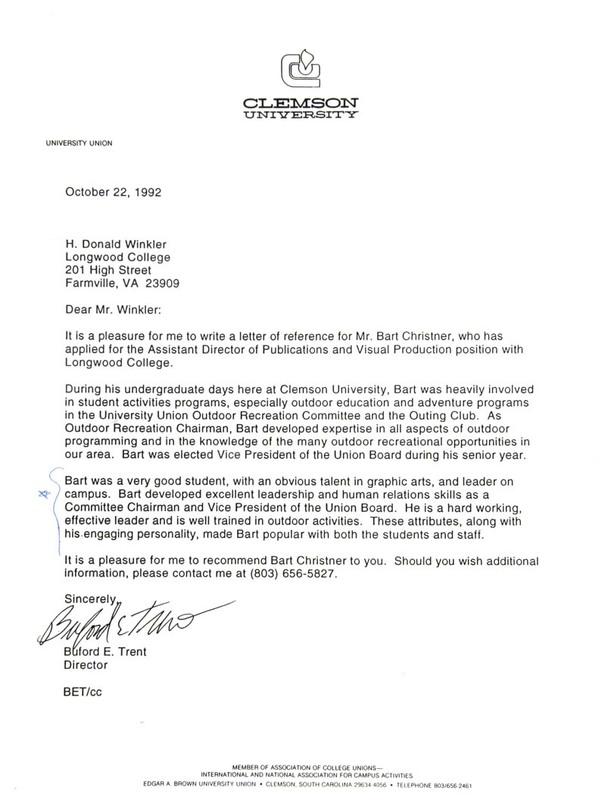 Bart was a very good student, with an obvious talent in graphic arts, and a leader on campus. Bart developed excellent leadership and human relations skills as a Committee Chairman and Vice President of the Union Board. He is a hard working, effective leader and is well trained in outdoor activities. These attributes, along with his engaging personality, made Bart popular with both the students and the staff. It is a pleasure for me to recommend Bart Christner to you. Should you wish additional information, please contact me.